The Red Carpet welcomes CEA cards under the terms and conditions outlined by the CEA card membership. Please note that to guarantee that we can meet CEA terms and conditions you will need to pre book your seats by calling the booking line on 01283 716257 at least one day before your visit. We do not accept CEA carers to ‘Event Cinema’ which covers all shows marked with a blue dot. The wheelchair space in the cinema is on the second row on the aisle. Please request this space when booking. This is the only space available for wheelchairs because it is the only area that is flat. The guest who sits here will be viewing from a screen distance of 4 meters. Please ensure this is suitable. We do have a fantastic loop system for the hard of hearing. Please ensure you sit in the correct zone as indicated when choosing your seats. We can easily accommodate wheelchairs in the café bar but it helps to have a pre booking if possible. We have a disabled toilet. All our facilities are on one level. Booking lines are open Monday to Sunday from 9:00am to 9:30am and then again from 5:00pm to 5:30pm. If our operators are busy, please leave a message on the answer machine. from 10am until 11pm, 7 days a week. Last food orders are at 8:45pm. We are located at Barton Marina, Barton Turns, Staffs DE13 8AS where there is free parking and some lovely shops and walks around the water. You can eat brunch, lunch or dinner in the Cafe Bar or just pop in for coffee or a drink without watching a film. Take a look at the Café Bar menu or Sunday menu. You can also watch a film in one of our little cinemas (you don’t need to be eating with us to book a cinema seat). Take a look at the film schedule. You may be interested in our Film and Food Night Out which consists of a two course meal in our cafe bar followed by the film of your choice for just £25.95. Our telephone booking lines are open Monday to Sunday from 9:00am to 9:30am and then again from 5:00pm to 5:30pm. If our operators are busy please leave a message on the answer machine. At the moment we can only sell gift vouchers at the bar. We can’t unfortunately take card payment over the phone. 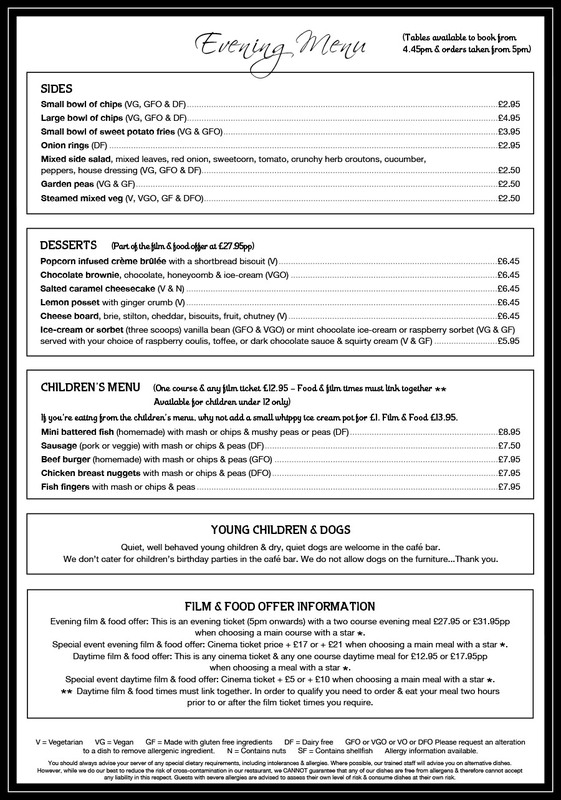 Our vouchers are available in £5, £10 and £20 denominations or you can buy the ‘film and food’ voucher for £23.95 per person. The voucher/vouchers are placed in a Red Carpet card with a red envelope for you to present as a gift. What is 'Film and Food?' - Film and food is a two course meal and an evening cinema ticket which has a package price of £23.95pp. You can have any starter and main course or main course and dessert from the whole of our menu. It's a lovely gift. PLEASE BE AWARE THAT LIVE AND RECORDED FILMS THAT HAVE A BLUE BUTTON HAVE DIFFERENT PRICES THAT ARE OUTLINED WITHIN EACH INDIVIDUAL FILM’S INFORMATION.